Jenny Holzer is an American neo-conceptual artist who belongs to the feminist branch of a generation of artists that emerged around 1980, looking for new ways to make narrative or commentary an implicit part of visual objects. Her contemporaries include Barbara Kruger, Cindy Sherman, Sarah Charlesworth, and Louise Lawler. 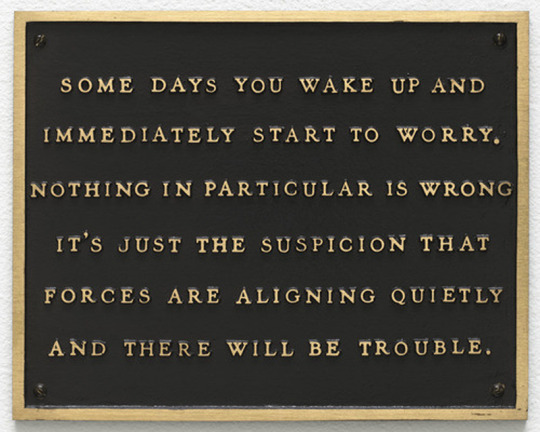 The public dimension is integral to Holzer’s work. Her large-scale installations have included advertising billboards, projections on buildings and other architectural structures, and illuminated electronic displays. LED signs have become her most visible medium, although her diverse practice incorporates a wide array of media including street posters, painted signs, stone benches, paintings, photographs, sound, video, projections, the Internet, and a race car for BMW. Text-based light projections have been central to Holzer’s practice since 1996. As of 2010, her LED signs have become more sculptural. Holzer is no longer the author of her texts, and in the ensuing years, she returned to her roots by painting. Below is her list of Trusims from 1978. These initial public works titled Truisms (1977–79), are among her best-known. They first appeared as anonymous broadsheets that she printed in black italic script on white paper and wheat-pasted to buildings, walls and fences in and around Manhattan. These one-liners are a summary of her learnings from her reading list from the Whitney Independent Study Program, where she was a student. She printed other Truisms on posters, T-shirts and stickers, and carved them into stone benches. 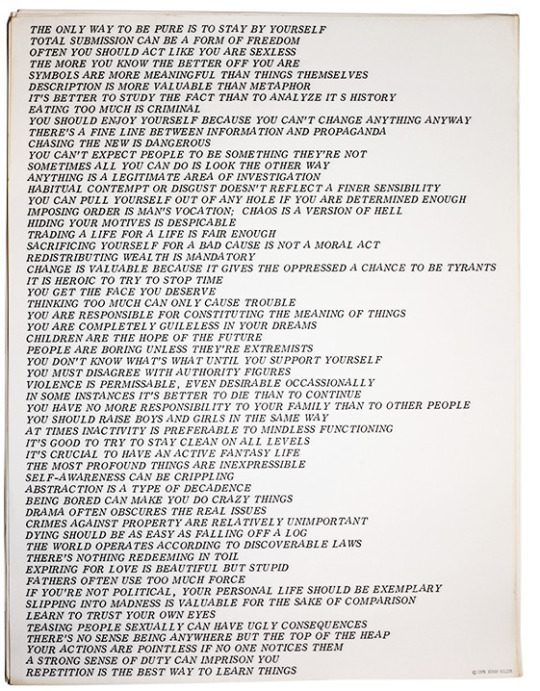 In late 1980, Holzer’s mail art and street leaflets were included in the exhibition Social Strategies by Women Artists at London’s Institute of Contemporary Arts, curated by Lucy Lippard.